Common dayflower, photographed in Delray Beach near Lake Ida Road. Common doesn't begin to describe how common common dayflower really is. The stuff, known scientifically as Commelina diffusa, is everywhere. Everywhere you look, everywhere around the globe. Or seemingly so. It's found in throughout most of Florida, including almost all of the Peninsula, the Caribbean, Mexico, Central America and South America. It's found throughout equatorial Africa, Australia and East Asia, including India, Bhutan, Tibet, China, the Koreas, Vietnam, Malaysia, the Phillipines and more. In the United States, it's found as far north as New York and Vermont, west to Kansas, Oklahoma and Texas. According to most sources, including the Institute for Regional Conservation and the Atlas of Florida Vascular Plants, common dayflower is a native of the "old world" introduced somehow to the Western Hemisphere. The U.S. Department of Agriculture has it as a native, however. Not being experts, we will leave the dispute to others to resolve. 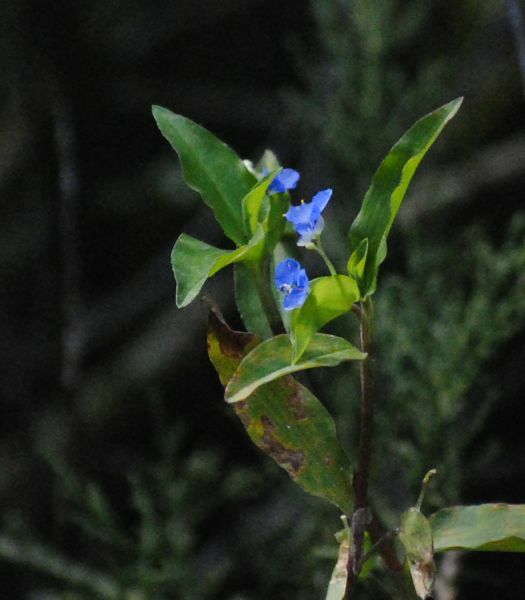 It is similar to the whitemouth dayflower, Commelina erecta, a Florida native. Whitemouth dayflower has two blue petals and one white and it tends to be more upright. 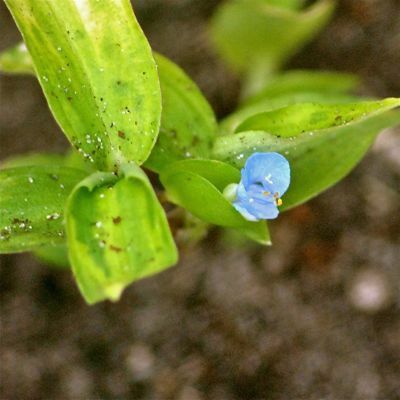 Common dayflower's petals are all blue and it crawls along the ground. Both are members of Commelinaceae, the dayflower family. It is edible, but it does contain oxalate, according to Eat the Weeds. It should eaten young and cooked to reduce the oxalate, a compound that can cause kidney stones. Common dayflower is found in "disturbed" areas, including roadsides, lawns and gardens, in woods and in moist areas, including swamps and marshes. In some places, it can form floating mats. It is a major agricultural pest and an invasive in parts of the world. It's a major problem for rice farmers in Texas. The plant's stem is jointed where leaves form; those joints also have nodes where roots can form. Break common dayflower, and new plants grow from the pieces, making it difficult to eliminate. Common dayflower is widely used to make medicines particularly in Asia. In Malaysia, the leaves are used for treating sores; crushed leaves and stems are used for irregular menstruation. In Indonesia, stems are used to cover dirty wounds. In South America, the Guyana Patomona boil the whole plant and drink the water before hunting. It's used for hair loss, kidney disease, to cleanse the uterus and tubes. Bruised plants are used for burns, itches and boils The petal juice is used to make paint. Women in the Torres Strait area between Australia and New Guinea rub their hair with it. Other names: Climbing Dayflower, Creeping Day Flower, Birdbill Dayflower, Spreading Dayflower. In Australia, it's also called scurvy weed.